Nov. & Dec. 2011 So here we are–our gardens put to bed for another year. The days are short and soon Santa Claus will visit. It’s so hard to believe that 2011 has gone by so fast. 2011 was an awesome year for the Dunnville Horticultural Society. Our fund-raising efforts were outstanding. Our new executive has been sworn in for 2012, with many familiar faces and a few new ones. Everyone is champing at the bit to put together our agenda for 2012 and it looks like it will be another stellar year. 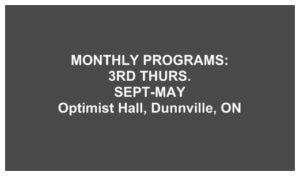 As everyone knows, membership is vital to the success of the Dunnville Horticultural Society. Our membership has grown this past year and we are hoping to see many new people sign up for 2012. Please ask your friends and neighbours…you don’t have to be an avid gardener to enjoy the meetings and lectures. Volunteers are definitely the backbone of the Society. Everyone works very hard and we have fun too. Our volunteers tend Dunnville’s numerous flowerbeds, run our booth at the Home & Garden show, organize our annual plant sale, and our rose, flower and vegetable shows. The Trillium Awards are also a huge part of the Society. We give recognition to homeowners and businesses in and around Dunnville who take the extra time and effort to beautify their properties. Not only do they beautify their homes, they also beautify Dunnville. Dunnville Christmas Tour: There will be a number of homes in Dunnville that will be open for a special Christmas Tour on November 26, 2011 from 10 a.m. to 2 p.m. Money raised will go the Salvation Army. Please contact Queen Street Paints for tickets. Tickets are $18.00 per person. In the New Year I will list dates for various Garden shows, open houses and lectures, as they become available. My next newsletter will be in January so on behalf of the executive and directors of the Dunnville Horticultural Society I would like to wish you a very Merry Christmas and Happy New Year. See you in 2012! Kim Christoff opened the meeting at 7:08p.m. President Judy Jeffery was unable to attend. Thirty-six people attended the meeting. Sue read the minutes from the October 2011 General meeting. Don Davis moved to accept the minutes as read and Pauline Bradford seconded the motion. Kim read the October 2011 Treasurer’s Report. Since the last meeting it has been determined that the treasurer’s report no longer has to be moved or seconded. Remembrance Day: Ian Steel was congratulated for the amazing job that he did on the Wreath that was displayed at the Cenotaph. You did us proud Ian. Please visit our website at dunnvillehortsoc.gardenontario.org to see wreaths that were on display on Remembrance Day. Trembling Aspens Herb Farm located at 9689 Concession 3, Castor Center is having an open house on November 26, and December 11. Details available at 905-957-3812. Membership: Pam Blanchard addressed the group regarding prices for 2012 memberships. They will stay the same as 2011: $10 for single member, and $15 for family. This year there will be an early bird draw for memberships that are purchased by the February meeting. The prize has not yet been determined. The yearly audit was discussed. Up to now we have been paying outside people for this service which tends to be expensive. It takes approximately 1 hour to go over the books to make sure everything is in order. No one on the executive, board of directors or their families is allowed do this. The membership was asked if anyone would like to volunteer to do this for us next year. Cindy Huitema and Barb White volunteered to do this for us. Thanks you so much to both of you. There is no General Meeting in December. January meeting: Annual finances will be discussed at this meeting. Hopefully we will be holding this meeting in our new location. The change will be announced in the Dunnville Chronicle and the Sachem. Members will also be contacted by phone. Betty announced Ways & Means tickets were on sale. Lori Maracle brought it to our attention that there was an ad in the newspaper announcing compost bins for sale. They are being sold at the Town Hall for $22.00 + HST. This is a real bargain compared to other places. A big Thank You to Jan Loots, Ian Steel and Steve Elgersma for all your hard work putting the town flower beds to sleep for the winter. Joelle Smith from Cole’s Florist in Grimsby demonstrated how to make arrangements with live boughs. She made 3 beautiful arrangements: 1 large one with birch branches, a hanging basket, and a table centrepiece. The 3 arrangements were raffled off. Everyone who signed the attendance sheet had his or her name entered. Mary VanOosten, Linda Muldoon and Catherine Poplawski won them. Joelle did an awesome job and made everything look so easy! Each table had a Christmas Cactus on it and they were raffled off. Person #3 at each table won the plant. Thanks to Debbie Thomas for purchasing the plants. They were so cute! Maura Cooper announced that she needs 3 volunteers to help her in the kitchen at each meeting. A sign in sheet was made available. Whoever volunteers to help in the kitchen will also be expected to stay and clean up. Thank you to anyone who has signed up. The Ways & Means draws were made. We raised $58.70. Thanks to Betty Ballanger for all her hard work organizing this.